A survival first aid kit isn’t the same as a survival kit; it’s the first aid equipment that goes into the survival kit. That means you have to make some very careful choices about what to include. You need to be able to cope with many different kids of emergencies, but at the same time you don’t have the luxury of taking a large first aid kit. You do need a few tools in your kit. These will make the performance of first aid so much easier, if they’re needed. Have a pair of latex gloves in there for safety when examining wounds. Scissors and tweezers are also important, as are a number of safety pins. Add to these an isolaid personal resuscitator. This is a membrane that allows mouth to mouth resuscitation, but at the same time gives protection, as the two mouths never directly meet. As it folds up into a very small space, it makes a good addition to the first aid kit. 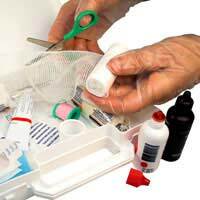 Dressings of different kinds will be the most commonly used parts of any first aid kit, and you should remember to replace them after use so you never run out. Your kit can’t cover every possible eventuality, so you need to prepare for the ones you’re most likely to encounter. Have an assortment of sterile dressings, some 50mm by 50mm, and other 75mm by 75mm. In that larger size also have 10 open weave wound dressings (you should also have an open weave that’s 75mm by 5000mm). You also need a good crepe bandage that’s 4500mm long and 75mm wide and some dumbbell sutures, say a dozen of them. You have safety pins, but you will also need micropore tape to keep the dressings on the skin. Have a full roll with you and replace it when you’re down to half; that way there’s no danger of ever running out. You obviously can’t carry a bottle of antiseptic with you into the wilderness. Instead you need a tube of antiseptic cream and some antiseptic wipes. These should be able to take care of most things and take up very little space. Finally, include some paracetomol tablets. These can prove extremely useful and versatile. All of these items constitute the basic survival first aid kit. If, for example, you need splints, these can be cut from a tree. The kit should only contain the very basics, and it helps if you have some first aid knowledge before setting out (taking a first aid course is always an excellent idea, whether you’re a survivalist or not). You can’t cover every eventuality, but you can play the odds. Depending on where you’re going, you might need additions to you first aid kit. Where there are plenty of insects, be sure to include a spray to keep them away. If you’re venturing where there are snakes, include a snake bite kit and learn how to use it (something you won’t need in Britain). Learn about any potential first aid problems where you’re going, and add the appropriate items to your first aid kit. Have a separate bag in your backpack for the first aid equipment, so you can locate it easily.